To link your designconnected.com account and display your products in Connecter, click on the connection indication in your Products panel, click “Sign in” from the drop-down menu that appears and then type your member’s name and password. All products you’ve purchased as well as all the free products you’ve downloaded on designconnected.com will appear in the Products panel shortly. If you don’t have a designconnected.com account yet, you can create one by clicking on “Don’t have an account?” from the accounts dropdown, or simply click here. Managing Workspaces | What’s a Workspace? All custom previews of your assets. All kinds of cached data like files thumbnails, indexed files and folders, etc. Your individual settings like Connecter UI layout and size, supported file types and other preferences. When you start Connecter for the first time you’ll need to create your workspace. You can choose to create a Personal or Team workspace. If you have an existing workspace left from a previous installation of Connecter, you can activate it by clicking the “Browse” button an selecting its location. If for any reason Connecter is not able to load its workspace it won’t start. Instead, you’ll get this interface with an information about the missing workspace plus options to create a new or activate an existing workspace. Team workspace allows multiple users within a team to collaborate by using a single shared workspace. All changes made by one user will be synchronized in real time with the rest of the team members. Keep in mind that the normal shared workspace is limited to 5 users that are simultaneously connected to it. If your team is bigger than that you should opt for Connecter Server. The workspaces created in Connecter Server are not discussed in this section of the Guide. When you create a new Team workspace you will need to select a network or a shared folder so that all other team members are able to connect to the workspace. If you choose a local and not shared folder Connecter will not create the workspace. Make sure that you have full access to the folder - this means that you will be able to create, edit and lock files. Without these permissions Connecter won't work properly. Contact your network administrator if you need help with the permissions and security settings. When you create a new Team workspace you’ll need to assign a password which will be used to manage the workspace. You’ll also need to type in a name (alias) you’ll use to connect to the workspace with. Though both username and password are grouped in a single interface, they are not related with each other. The username is the name which each Connecter (installed on different PCs) will use to connect to the shared workspace. So if you’re a team of four, there will be four Connecter instances each having its unique name for accessing the Team workspace. In order to manage team users and their access rights within the shared Team workspace, you’ll just need this password and a Connecter which is connected to the workspace. This means that you can set up a Team workspace from one instance of Connecter and then manage it from every other Connecter. To manage a Team workspace go to Edit menu > Workspaces and then click Manage button and then type in the password used to create the workspace. In the “Manage team members” interface you will see all members who have successfully connected to the shared Team workspace. You can grant a selected member full permissions (read, write and edit) or just a read access. A member with read-only access will not be able to make any changes in the workspace (add custom previews, categories, remove or add folders, etc.) but will still be able to personalize by using options like: starring and hiding of files and folders, filtering folders, change Connecter settings and others. Managing Workspaces | Personal or a Team workspace? If you’re a freelance artist or a one-man studio you most probably need a simple Personal workspace environment. If you’re a team and need to share a single workspace among multiple computers/users then you’ll need to set up a Team workspace. We’ve illustrated the most typical use cases of using Connecter on multiple machines or in a Teamwork environment. The most simple setup is to have all your assets plus Connecter’s workspace on an external drive. It’s important to have the external drive under the same name (e.g. D:\, E:\, etc.) across all your computers (desktop PC and laptop for example) so that all paths to folders and assets in Connecter stay intact. If for examples on your laptop the assets are in D:\assets\ but when you attach the external drive to your other computer it’s E:\assets\, Connecter will show all added folders as missing. In this case you can use the relocate option (right click on a missing folder) to show Connecter the new folder’s location. Another option is to store all assets and workspace on a shared local network device (network drive, NAS, File server, etc.). 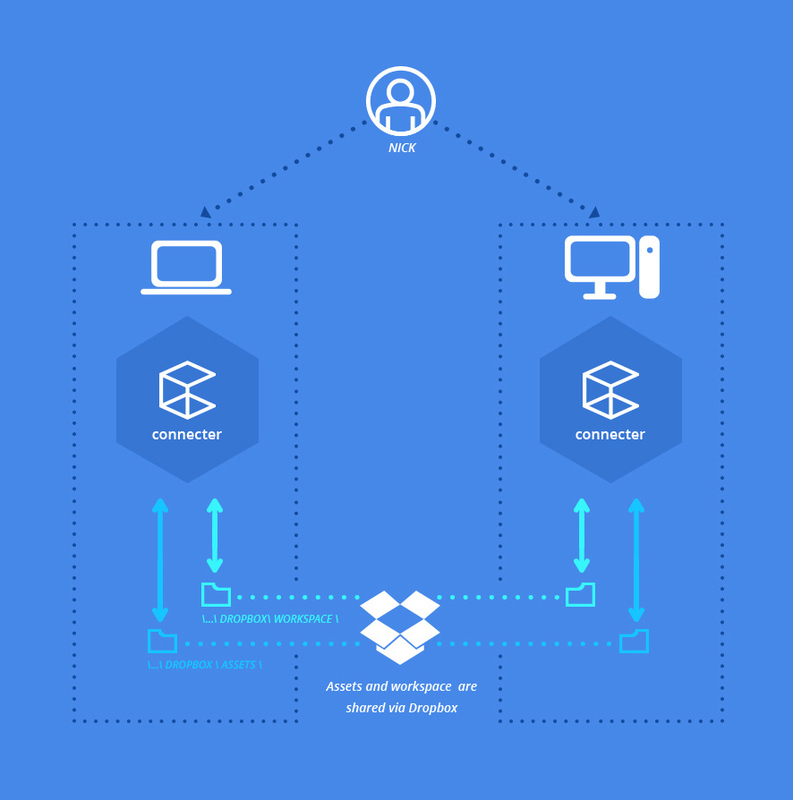 Another good option to share assets and workspace across multiple computers is to use Dropbox (or Drive or other similar service). 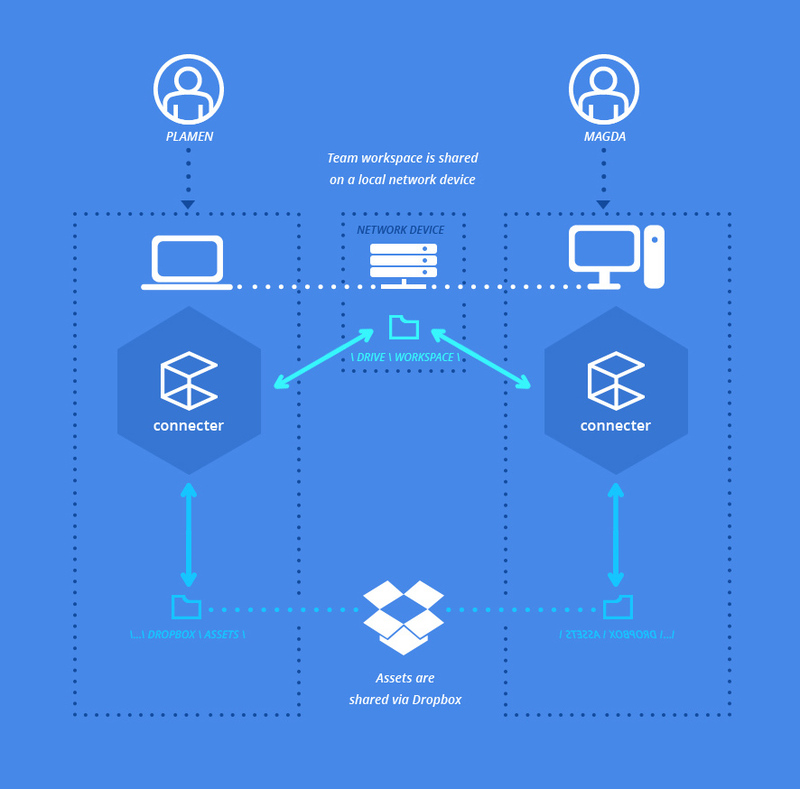 It’s important that if you use Dropbox you must not use Connecter simultaneously on multiple computer as there’s a big risk to damage your workspace when Dropbox synchronizes the changes. 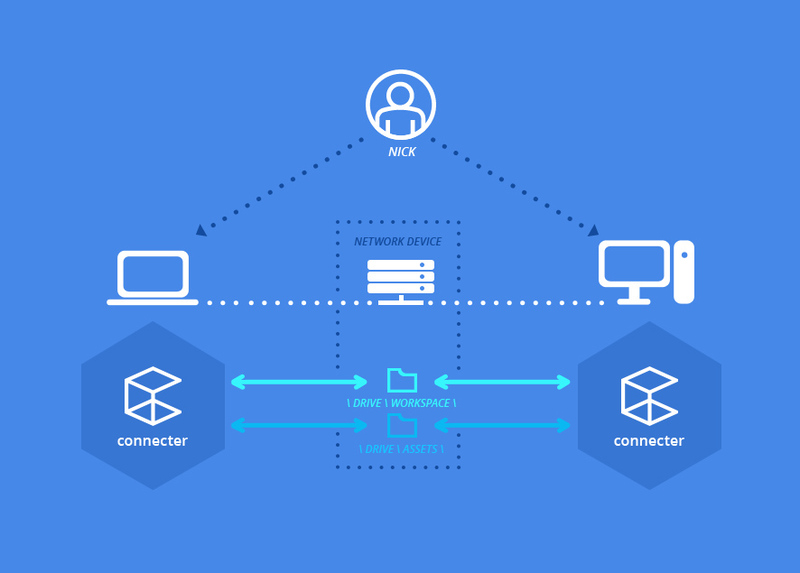 If multiple users will use Connecter simultaneously in a shared team environment you must create Team workspace and share it on a local network device (network drive, NAS, File server, etc.). 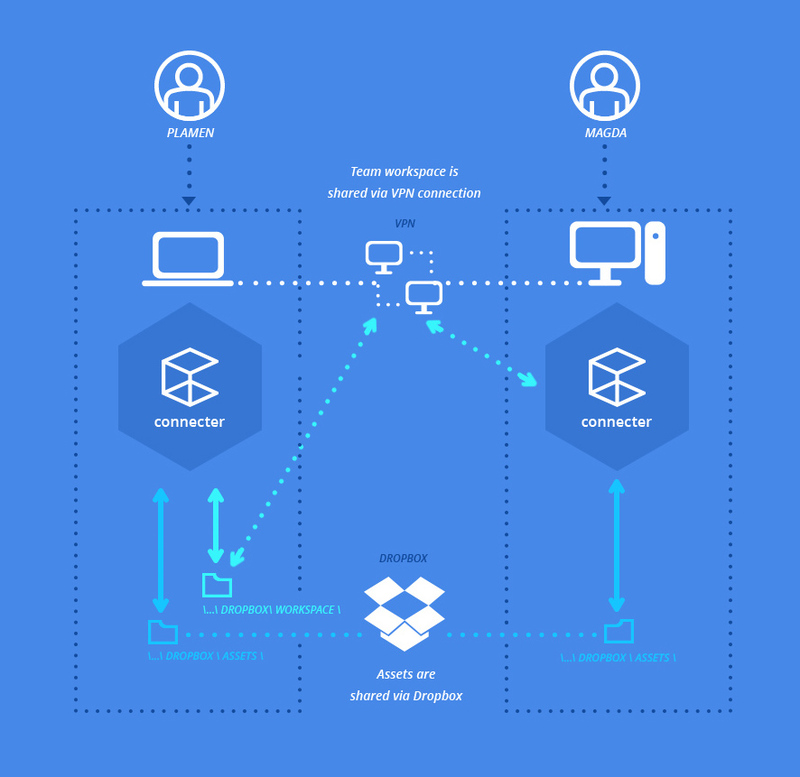 The assets can be shared on the same(or other) location or via Dropbox (or Drive or other similar service). If one or more team members are not part of the same local network they will need to access the shared Team workspace via VPN connection. Manage external files or MEF is a powerful tool to manage external resources of your 3ds Max files without the need to open them in Max. You can edit one or multiple 3d files simultaneously. IMPORTANT: ALL CHANGES IN MEF DIRECTLY AFFECT THE 3D FILE(S) BY SAVING THE CHANGES MADE. CURRENTLY THERE’S NO UNDO OPTION. Use “New path” to change an existing external file’s path with another. Also works on multiple paths. Very useful if you have your assets moved to a new location (while keeping the same folders structure) and you just need to update all external files paths to point to the new location. Use to change a file’s path with the path where the file has been found – normally after a user-initiated search or when Connecter has automatically discovered the file. Use Copy to collect all external files in a new location. Additionally, you have the options the update, strip paths or keep them intact. You can rename a selected external file. This won’t rename the external file itself but rather its name in the Max file. You can replace one or more external files with another file while keeping the paths intact. You can remove selected external files from being used in a 3d file. This option will completely wipe off the information about the external resource in the 3d file as it has never been used. Connecter Server | What’s Connecter Server? Connecter Server offers high performance and reliable digital assets management for large teams through shared workspace database hosted locally, on self-managed servers or in the cloud. It also comes with its own ready-to-use server-based teams and members management with flexible access permissions controls.